The electrochemical flow capacitor (EFC) is a new technology, developed at Drexel University, for grid energy storage that is based on the fundamental principles of supercapacitors. The EFC concept benefits from the advantages of both supercapacitors and flow batteries in that it is capable of rapid charging/discharging, has a long cycle lifetime, and enables energy storage and power to be decoupled and optimized for the desired application. The unique aspect of the EFC is that it utilizes a flowable carbon-electrolyte suspension (slurry) for capacitive energy storage. Similar to traditional supercapacitors, this aqueous based slurry is limited in terms of energy density, when compared to batteries. At Drexel, working with Prof. C. Kumbur, we are looking at increasing energy density of the flowable electrode through enhancing the capacitance via pseudocapacitive means, and the voltage window through the use of organic electrolytes. (a) During operation, a flowable carbon-electrolyte suspension (slurry) is pumped from a storage reservoir through two polarized plates (charging process). 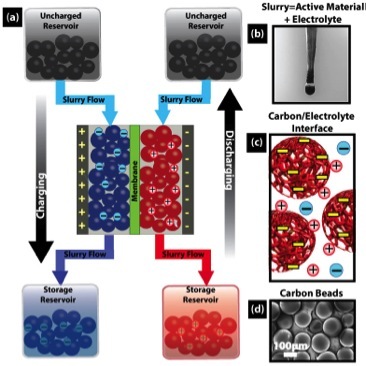 Once fully charged, the slurry is pumped out of the cell and stored in external reservoirs until the process is reversed and the slurry is discharged; (b) A droplet of the flowable carbon slurry; (c) Schematic of a carbon|electrolyte interface between charged spherical particles and; (d) SEM image of carbon beads used as the active material in the flowable electrode.